Bhanu grew up in India and moved to US for graduate studies. She received her Ph.D. in Materials Science and Engineering from University of Illinois, Urbana- Champaign. Since her Ph.D. Bhanu has been actively conducting research in diverse areas in Europe and US . She currently lives in Ohio, USA and balances her time between family, career and volunteering. My daughter, Divya (second year Indicorps Fellow), invited me to attend the February 2013 Indicorps workshop with her. When the invitation came, it was, as a mother, hard to turn down the opportunity. I joined Divya on the seven day workshop in Maharashtra and then travelled with her to Chandigarh to spend four days in Janata Colony – Divya’s “home” away from home. While packing for my trip, Divya advised that I should travel light with a backpack and be prepared to rough out at some places by sleeping on the floor. Doubt crept in. “Had I made the right decision?” I wondered. Could I, at my age, manage a camp style life immediately following the long journey from Columbus, Ohio to Nagpur, Maharashtra? At this point, I decided to drop all my hesitations and go with the flow of what was to come! After a long journey, I reached Nagpur in the early morning. I hired a taxi from the airport and headed to Anadwan. Anandwan is a wonder work of Baba Amte that was established to offer a life with dignity for leprosy stricken patients who were abandoned by their families and society. I reached Anandwan in time for the start of the Indicorps workshop and joined the opening session. I was gracefully introduced to the Indicorps fellows and staff by Dev Bhai (Dev Tayde-Indicorps Director). From then on I was accepted as a workshop participant and was referred as “Auntie” by everyone. The staff and fellows were friendly and made me feel one among them with their love and respect. As a parent, I came to the workshop with a meager knowledge of Indicorps’ philosophy. In addition, at the start of Divya’s first year as an Indicorps fellow, our family had to face a medical emergency without her being close by due to Indicorps’ immersion policy. These circumstances raised questions in my mind about Indicorps view points; “Why such strict discipline, and why the “bare bone” simple living”? The three days at Anandwan were profound – mingling and watching the physically challenged (those stricken with leprosy, as well as the blind, deaf and dumb) and how they led independent and happy lives. The day at Anandwan started with the fellows and staff serving at the dispensary – washing wounds of leprosy patients. On the first day I was not comfortable with this undertaking. In fact it was scary to see bloody and deep wounds on the hands and feet of the patients. The following two days turned into a soul stirring experience. Looking into the patients faces and conversing made me connect with them and from then on I was able to serve them with out any fear. After the dispensary work and a short break for breakfast, the Indicorps sessions began. The sessions were interspersed with service activities and meetings with dedicated social workers, such as Dr.Bharathi and Prabhu Kaka. The sessions were diverse- crafted to push the limits of Indicorps Fellows for personal growth and to carry out their projects to their fullest potential. The sessions ranged from simple discussions, playing games, monologues and street plays to watching relevant inspirational Ted Talks. These were created for character building, imparting discipline, developing swift thinking skills, introspection, empathy, selfless service, bringing social awareness, change through community immersion, and team spirit. The daily workshop schedule was intense – tightly filled from 5:30 am to 11:30 pm. I was thrilled to be a participant alongside my daughter and attended most of the sessions. I also very much enjoyed the time I had spent with all of the fellows during the sessions and at meal times. Our discussions ranged from their projects, their perspective of the program and, in some instances, their personal lives. I was impressed with all of them in their keen interest in the program and adherence to discipline. In between Divya inquired a couple of times how I liked the workshop. My answer to her was to let me first observe and absorb. 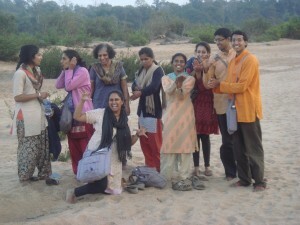 After Anandwan, we moved onto Hemalkasa (5 hour road trip). Dr. Prakash Amte and his wife Dr. Mandakani have sacrificed the comforts of urban life and started a hospital here in 1970’s for the Madia Gond adivasi people. The initial hospital project has now transformed into three major programs: a hospital providing health care for adivasis and surrounding villagers, a residential school for tribal children and an orphanage for injured wild animals. Our meetings with Dr. Prakash Amte and his family were wonderful. Dr. Prakash Amte’s simplicity, his true dedication to serve the adivasis and his love for animals were touching. Interacting with the adivasi children in the school and learning a tribal dance from the hostel girls was simply delightful. During the workshop at Hemalkasa, I began to get into the spirit of Indicorps. Long walks with Dimpy, (a previous Indicorps staff member) were a treat. She seemed to imbibe and follow simple human values very naturally. It was also valuable to watch how Dev Bhai mentored the Indicorp Fellows through the path of “Listen, Learn, Love and Lead”. While he barely spoke during workshop sessions, Dev Bhai was ready at the right time to jump in for feedback and guidance. Of course, Krishna Dahya with her charming smile, conducted the workshop sessions beautifully with strict discipline. At the end of workshop, Divya, Dimpy and I were the last to leave Hemalkasa to take 9:30 pm train from Balharshah station to Delhi. While waiting for the train, we celebrated Divya’s birthday with bananas (in place of cake) in the station waiting room. We reached Delhi the next day at 6:30pm and took a bus to Chandigarh. Upon arrival in Chandigarh, Divya tried to bargain for a auto rickshaw to take us to the Janata Colony slum community. The auto driver was hesitant and warned us that it was not a good place for people like us to go. Divya patiently explained that she is going there for “Seva” and it was alright for us to go. After driving through the well-lit modern Chandigarh city streets, the auto finally reached the dark, narrow alleyways of Janata Colony. Being concerned for our safety the driver dropped us right in front of Divya’s room in spite of our request to be dropped off at the end of the street close by. I stayed with Divya at Janata Colony for four days. Divya’s room is very small with no material comforts whatsoever with an open sewage adjacent to the front door. The two adjoining rooms were used by Divya for the library in the evenings. Her room was cold with open window grill at the top. I could not imagine how Divya managed the harsh Chandigarh winter in that room! Divya referred to a loose gas cylinder at the corner of the room as “her kitchen”. It just blew my mind! We both were tired and I was overwhelmed with the conditions under which she was living – this soon resulted in us arguing. When Divya asked me if I would like to move into a nearby hotel, I decided to stay back and experience the life as she was living. During the next four days I followed Divya, watched and helped (where ever I could). Our daily routine consisted of spending the morning and early afternoon (till 3:30 pm) at Chhoti Si Asha (the womens stitching center). We then went to the colony library from 4 to 7 pm. Divya has built a great relationship with the women at Chhoti Si Asha. They are very fond of her and she commands lots of respect and adoration. They look upon Divya for guidance in many of life’s issues – such as medical help (taking them to the doctors), advise on their children’s education and a host of other challenges of daily life. The women were happy to meet me and I had many invitations to dinner and tea with their families. Some of them wanted me to talk to their kids about my profession (Scientist/Engineer). I interacted with the women at Chhoti Si Asha and told them in my simple Hindi why women can do better in life with education. I shared my own experiences of accomplishing my higher education goals in the US and my professional life. By the time we returned from Chhoti Si Asha, the children were waiting outside the library for Divya to open the library doors. Due to lack of space, the library runs in shifts – 4 to 5pm for the younger children and 5 to 7 pm for the older children. A total of 60 – 80 children show up every day at the library. I got to know the children, spoke to them and helped with their math. They love Divya and do not like to leave the library at the end of the day. It was a pleasure to watch Divya interacting with children with so much love and passion! Divya’s engagement with a couple of neighborhood children during her first year soon evolved into the beginning of the library as she realized its need in the community. Now the library needs sustainability and the next level of improvements. Divya is in search of methods to make the library continue and thrive when she leaves at the end of her fellowship. At a personal level, it was truly a soul searching and inspirational trip for me. I was deeply touched by my time at the workshop and my stay in Chandigarh with Divya. Many times during telephone conversations with Divya when she was a first year of fellow she would say “Mom your India and my India are different”. I did not really understand the depth of her statement until I stayed at Janata Colony with her. ing born and brought up in an Indian middle class family, I never had to interact with the slum community except with the domestic help at home. The concept of complete immersion with the community never existed. During this brief stay at Janata Colony, I did get a brief glimpse of slum community poverty, their struggles and the negligence of their problems by governing bodies. When I initially went to the workshop, I had many questions as a parent regarding the intense training of Indicorps. As my brief immersion into the workshop progressed, I began to get some of the answers. My family and I have often wondered and worried about Divya and her staying at Janata Colony for community immersion. It is a very tough experience to live amongst the poorest and witness their problems/dilemmas (poverty, violence, neglect of children, abuse of women, and even death). Now, I begin to understand that Indicorps immersion training has multi fold purpose: the first is body, mind, and soul absorption for the cause while living in the community to understand their issues and gain the trust and acceptance of the colony members. The other important purpose it serves, I believe, is it fosters the ability to bring out ones dormant energy to function as a better human being. It transforms the person far beyond the material boundaries for developing empathy for fellow beings and brings out the best in those willing to serve under these conditions. I believe that the values cemented though Indicorps training, will be of immense value in every walk of life of all of these Fellows for the rest of their lives. Even though, as a parent, I constantly pray for the safety and health of Divya, I am happy to see the amazing personal growth that has occurred in her during the last year and half. Thus overall, I have no doubt, that after their Indicorps Fellowship experiences, Divya and other Fellows will cherish these ideals and play their own roles in creating a better world for all. I would like to end by stating that my brief immersion with Indicorps has been one of the most memorable experiences; it has left me with many views about India’s rapid technical and financial progress on one front and the marginal progress on poverty issues in underprivileged groups.